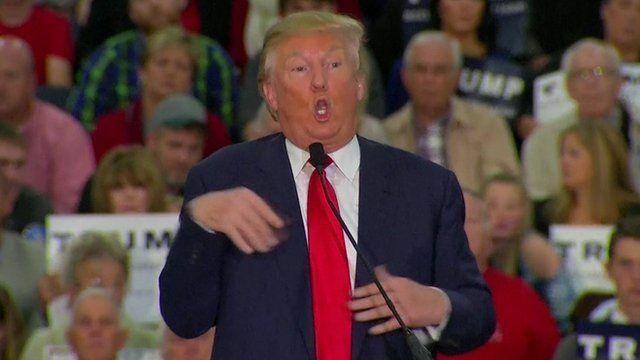 Trump criticised for mocking disability Jump to media player Republican presidential contender Donald Trump has been criticised for mocking a disabled New York Times reporter. Carson: 'I would not advocate a Muslim' Jump to media player US Republican presidential hopeful Ben Carson says he does not believe a Muslim should become president. Trump mocks Carson's knife attack Jump to media player Donald Trump attacked Republican rival Ben Carson at a rally in Iowa by questioning his claim he attacked a friend with a knife when a teenager. Can Trump 'trump' his US rivals? Jump to media player The BBC's Jon Sopel looks at the success of the Donald Trump campaign as the politician takes part in a Republican debate. Republican presidential contender Donald Trump has been criticised for mocking a disabled New York Times reporter. Mr Trump performed an impression of Serge Kovaleski, who suffers from a congenital joint condition, at a rally in South Carolina. He has used a 2001 article by Mr Kovaleski to back up widely disputed claims that "thousands" of Muslims in New Jersey celebrated the 9/11 attacks.